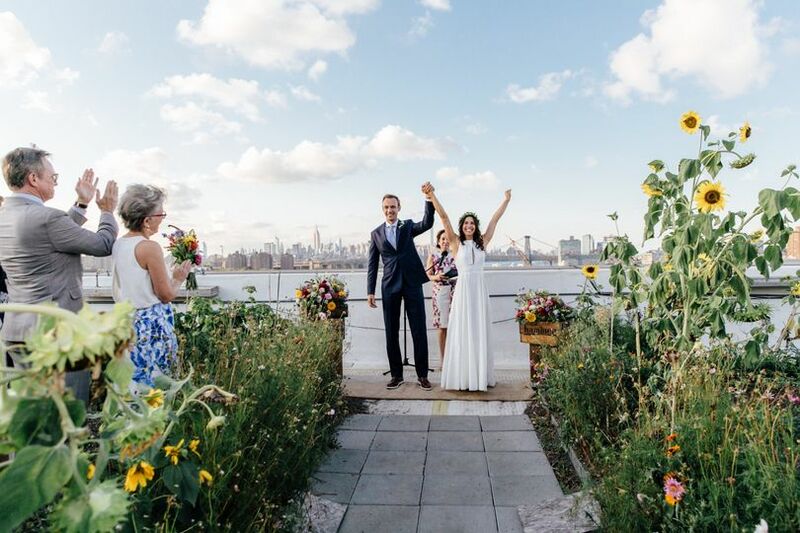 A unique and romantic wedding ceremony and reception venue located in Brooklyn, New York, the Brooklyn Grange Rooftop Farm offers a space that is intimate, memorable, and unexpected for your rooftop, garden wedding. 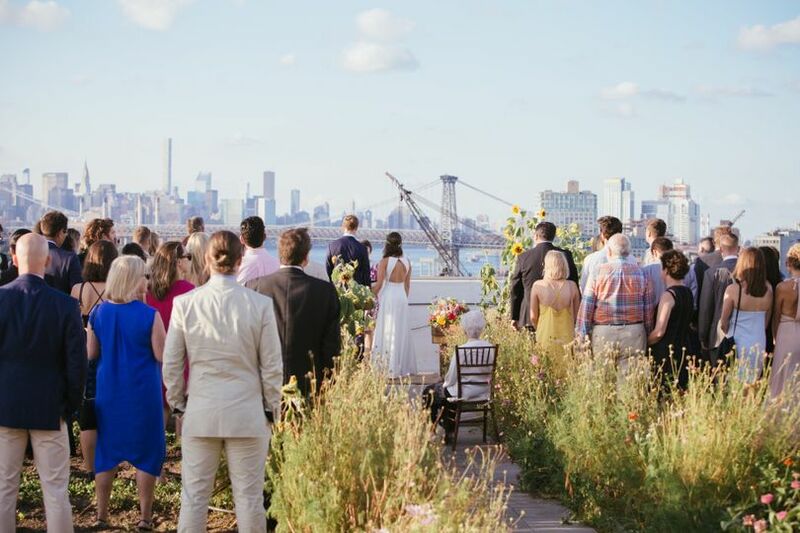 For couples tying the knot at this breathtaking venue, the private space is perfect for enjoying towering sunflowers, rainbow-colored sunsets, and the breathtaking view of the Manhattan skyline just across the river. 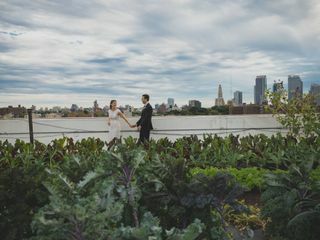 This 2,000-square-foot paved deck garden rooftop farm features a garden that sits atop the Brooklyn Navy Yard, and the venue allows couples to host between 40 and 150 people. It's even complete with parking and handicap accessibility. 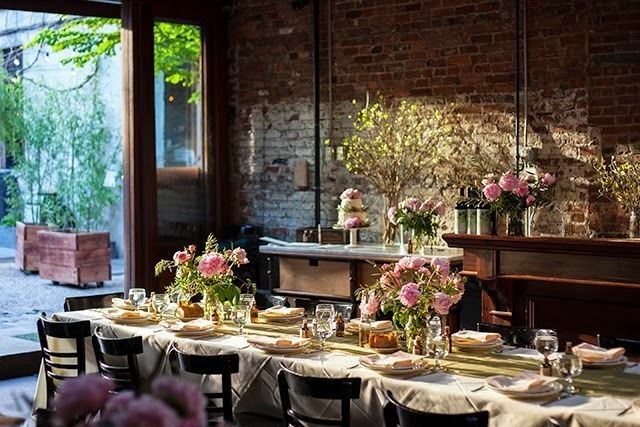 With banquet tables created from dramatic, reclaimed wood, the facility serves as the ultimate city destination with the charm of a farm. 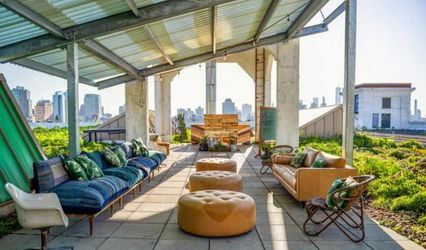 The venue takes the concept of farm-to-table to a whole new level with its menu consisting of plates where vegetables grow in close proximity to where you sit. 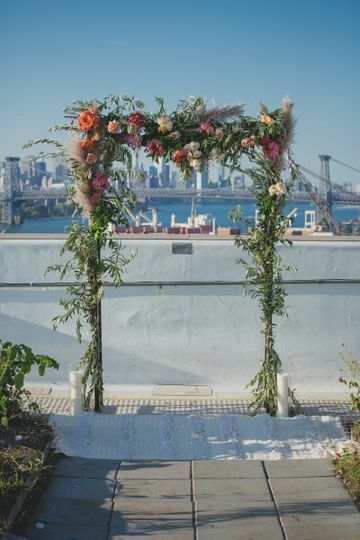 In coordination with the best caterers, rental companies, event stylists, and floral designers, the Brooklyn Grange Rooftop Farm helps you transform the space and piece together your dream wedding. 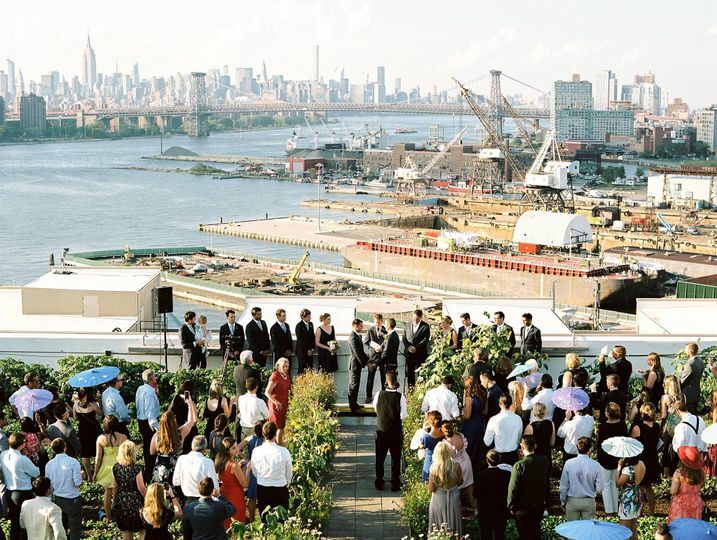 The idea to build one of the largest soil rooftop farms came to fruition in May 2010. 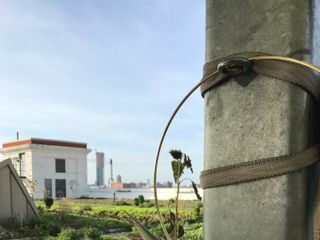 Within six days, crews took hundreds of 3,000-pound soil sacks up seven stories to the roof, where they began to shape an urban farm. 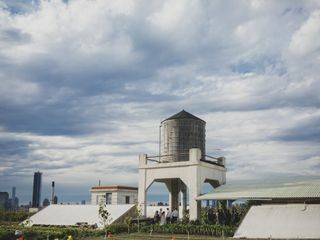 The hope of creating the rooftop farm was to develop the unused spaces of New York City and to create a fiscally sustainable system of urban agriculture. 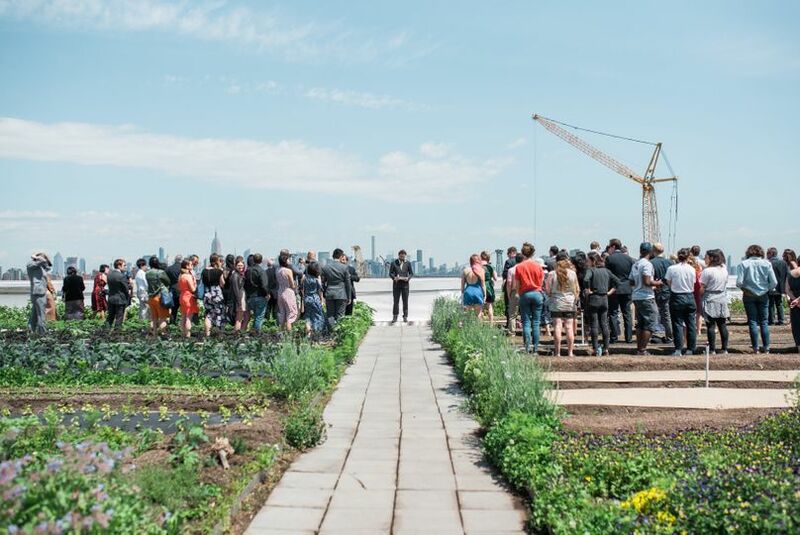 Ultimately, the goal also included the production of healthy and delicious vegetables to support the ecosystem and provide for the local community. Since its culmination, the city has become more sustainable with cooler air and cleaner waterways. 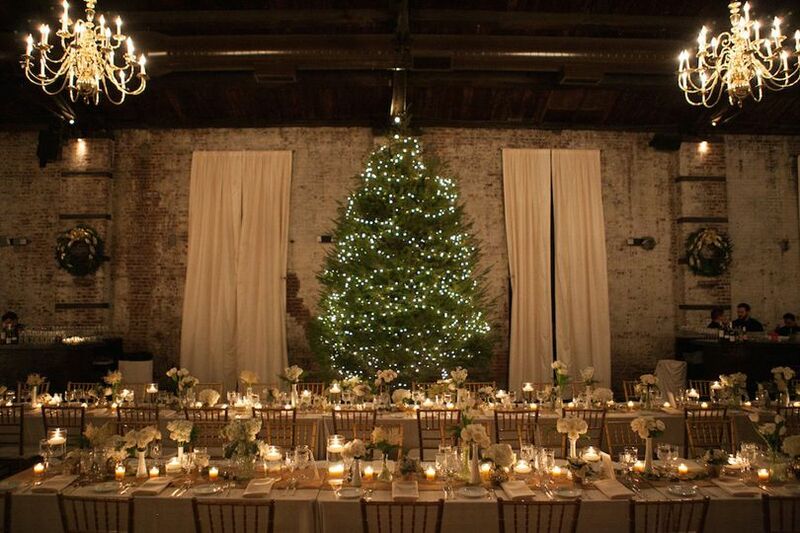 If I could have a wedding at Brooklyn Grange every year I would! 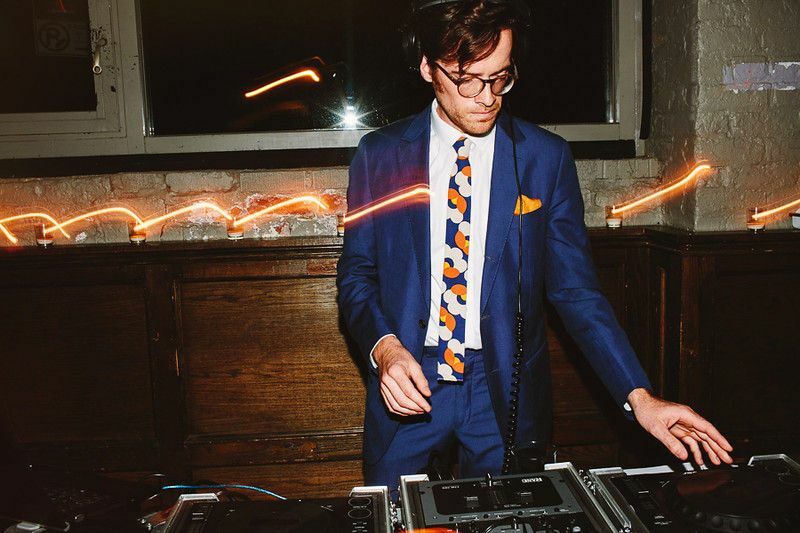 This venue is contagiously magical and is one of the most beautiful places in the entire city. Working with Michele, Claire and Chelsea was an absolute joy. The entire team buzzes with positivity, and everyone was so responsive, thorough, helpful, and relaxed throughout our planning. 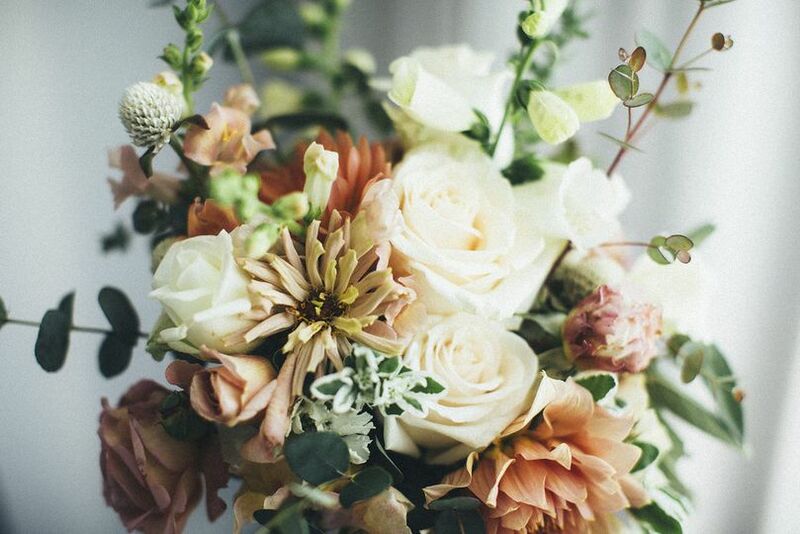 They worked seamlessly with our other vendors which made our wedding day an absolute breeze. 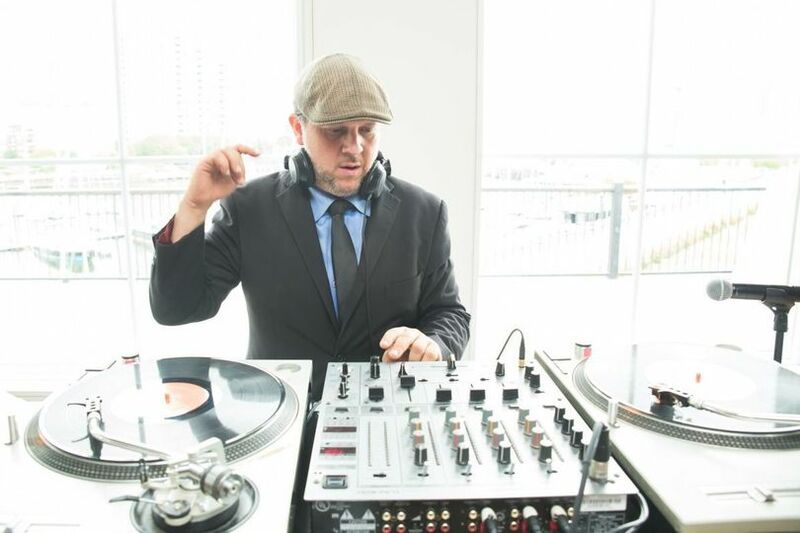 Our friends and family are still talking about their time at Brooklyn Grange, it was definitely a special night and one to remember. 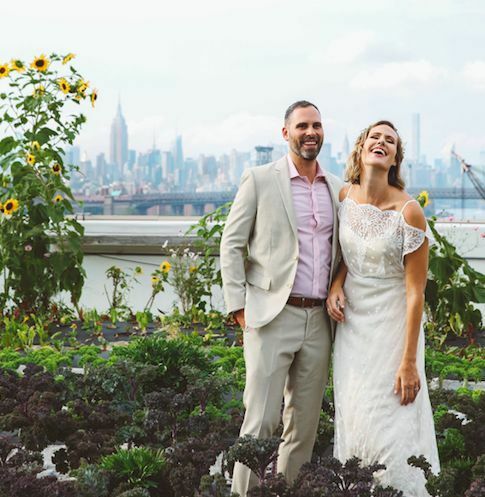 The Brooklyn Grange was the best wedding venue we could ever imagine. 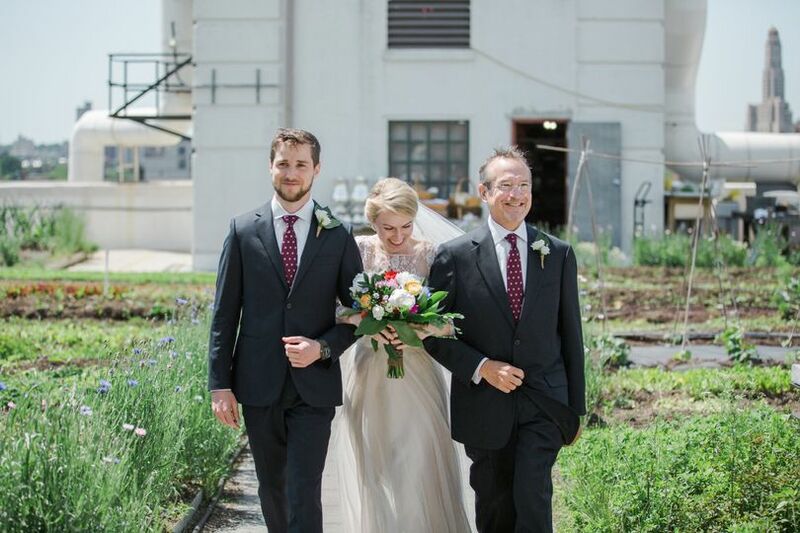 The Grange provided the perfect place to have an outdoor wedding, but still in the city. 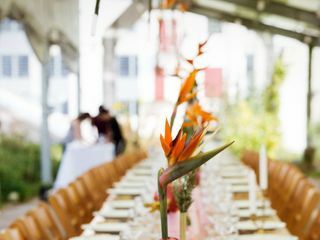 The event staff at the Grange were the most professional and helpful vendors we worked with. 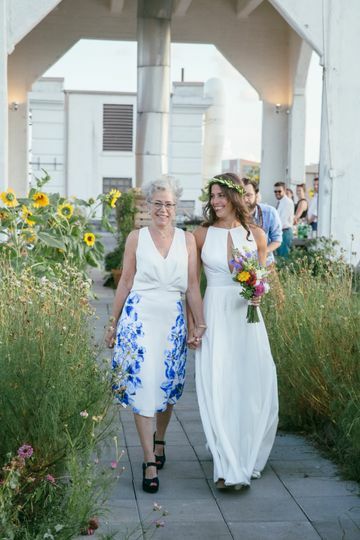 Choosing the Brooklyn Grange as our wedding venue was one of the best decisions we made during our whole planning process. 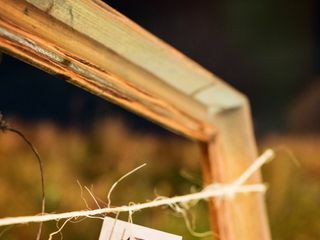 The staff is the friendliest group of people and they helped out every single step of the way, making sure that our needs came first. 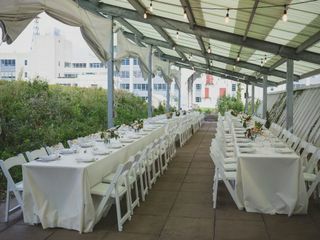 They also made sure our guests were comfortable on the rooftop during our wedding (even providing blankets when it got a bit chilly after sundown). 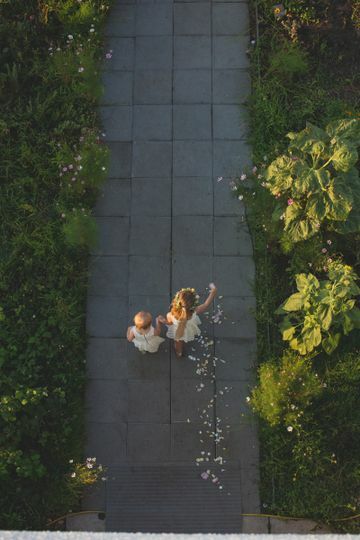 Not to mention all the greenery makes for the perfect wild and urban backdrop. Would highly recommend!